Peerless Plastics and Coatings latest business strategy has begun with a key investment in a 2500 H-LED Hybrid UV printer from SSE Worldwide. The deal was signed during FESPA 2016. The machine will be installed at the company’s site in Thetford, Norfolk where a refurb has already taken place and a coating line removed. Scott Armitage, Managing Director of SSE Worldwide and Phil Little, Technical Director of Peerless Plastics and Coatings shook hands at the show. Armitage says: “This is a unique installation. Peerless is moving forward into new markets and we are pleased to support this exciting business strategy. 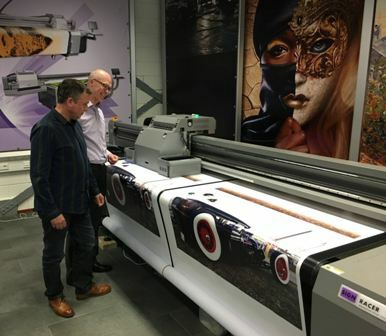 The prnter is proving extremely popular as a highly versatile, reliable and affordable machine of choice which fits easily into any production environment. The adjustable UV LED curing capability allows the printing of temperature sensitive substrates and enables companies to print onto a wide range of materials and objects. The capability and versatility of this UV printer opens up new markets for added-value printed products.